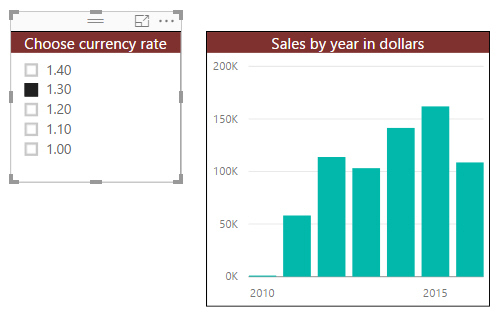 Is Power BI Desktop strictly just a management reporting tool for the past, or should it also be a modelling tool for predicting the future? Microsoft clearly believe it should be both. Sales at 1.3 dollars to the pound. Second, what happens if the dollars appreciates - say to $1.1 to the pound? The same chart, but with 1.1 dollars to the pound. 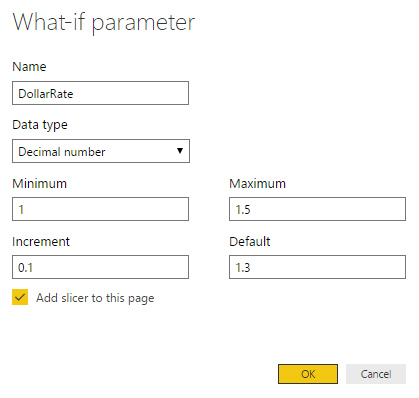 The slicer on the left is based on a what-if parameter, which allows you to choose which of a set of current values you should use in a measure. Choose this option on the Modelling tab of the ribbon. The parameter value will go from 1 to 1.5 in 0.1 increments. By default the parameter will take the value 1.3. ... and a slicer based on this. 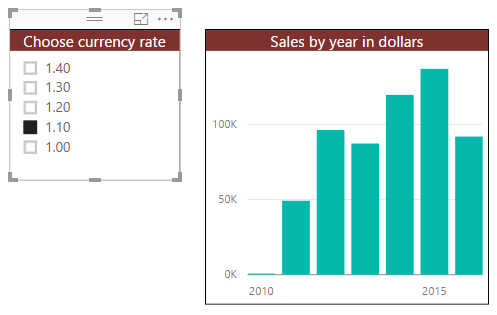 For those who have used parameters in Power BI Desktop, this doesn't create an underlying table in Query Editor, and having created the table there's no obvious option for going back to edit your settings. 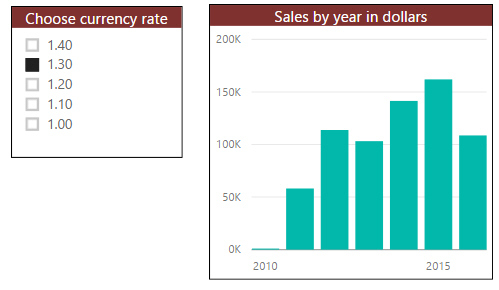 This measure calculates total sales value multiplied by the current dollar exchange rate. 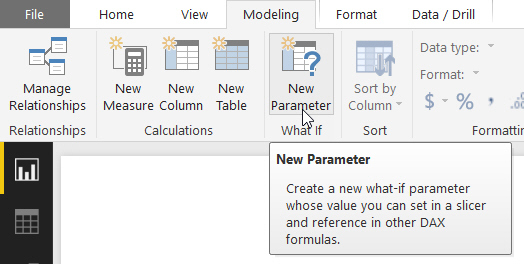 Even though the "parameter" is a table containing multiple values, only one of them can be current at any time. The chart will update when you choose a different dollar rate. What-if parameters are thus like a wizard, which generates a table of values that you can choose from.